A case can be made that Rudolf Hess, Deputy Führer to Adolf Hitler from 1933–1941, can be viewed as a de facto—I stress de facto, or in effect—member of the German opposition by the time of his quixotic (in retrospect) 1941 flight to Scotland on a failed mission to forge peace between Great Britain and Germany. Though he remained loyal to Hitler, Hess’s unauthorized flight and peace proposal were clearly acts of high treason, assuming Hitler did not authorize them. Like many in the German resistance, Hess foresaw war with both the United States and the Soviet Union, and desired to avert the carnage. Hess immediately discussed possibilities with his old professor, Karl Haushofer, the well-known exponent of geopolitics, with whom he had remained close. Haushofer, who maintained contacts with Left-wing socialists, advocated an essentially German-Russian (i.e., Communist) alliance. His wife, a half-Jew, was protected by Hess, who saw to it that she was granted “honorary German” status. Karl Haushofer informed his son Albrecht about Hess’s approach, and between September 1940 and Hess’s surprise May 10, 1941 flight to Scotland, the two worked together in an effort to establish contact with British (and, on Haushofer’s part, American) officials. Albrecht Haushofer—like his father a close friend of Hess’s—taught Political Geography and Geopolitics at the Berlin School for Politics from 1934, and at Berlin University from 1939, while simultaneously working for the German Foreign Ministry staff. Throughout the 1930s Albrecht served as an adviser to Hess. Under the Nuremberg Laws, Albrecht, a quarter Jew, was, like his mother, classified as a mischling (Jewish-Aryan hybrid). But Hess saw to it that a German Blood Certificate was issued to him. In a letter to his mother in 1939, Albrecht wrote that Germany was run by “criminals and fools.” His scholarly work, focusing on current international affairs with a partisan edge but published in prestigious academic journals, was so outspoken according to historian Peter Hoffmann, that hardly anyone in Germany was able to speak as freely as he could—thanks to Hess’s protection. Albrecht Haushofer maintained contact with three internal anti-Nazi groups: the Hassell-Popitz-Langbehn group, the Kreisau Circle (Left-wing), and the Red Orchestra (Communist) whose Berlin leader Arvid Harnack taught at the same institution as Haushofer. Working from within the system while posing as a patriotic and trustworthy German, Haushofer surreptitiously used his influence whenever possible to undermine the regime and attempt to establish contact with Allied-Communist officials. A historian has written that after November 1940 Haushofer successfully made contact with Britain, acting as an unofficial emissary with official cover and at the same time as a representative of the opposition. Haushofer tried to dissuade Hess from meeting with the Duke of Hamilton , the Scottish nobleman and Air Commodore Hess ultimately parachuted into Scotland to see, and did in fact meet. Haushofer suggested that he, Haushofer, would make a better contact, for, “like many Englishmen [sic] H is extremely reserved with people he does not know personally.” Hitler biographer John Toland characterized Hamilton as Haushofer’s “own closest English [sic] friend.” Toland described Hess as a member of the “opposition within Hitler’s inner circle” to the invasion of Russia. Ultimately, Haushofer did dispatch a letter to Hamilton at Hess’s request, which apparently reached its target. This was separate from a letter to Hamilton drafted by Hess himself, which was intercepted by British intelligence. In Peter Hoffmann’s words, “Hess wished to help Hitler conclude peace with Britain; Haushofer wished to exploit the resulting possibilities of contact for the benefit of the opposition, to create the external conditions for a coup d’état” (p. 207). 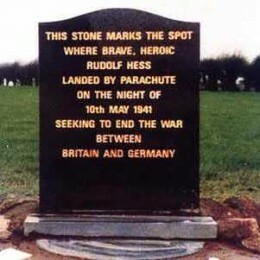 Hess’s May 10, 1940 solo flight to Scotland—an amazing feat executed with extreme technical precision—caught Albrecht Haushofer, who had nothing to do with it, as well as Hitler and everybody else in Germany, by complete surprise. As a consequence, the Haushofer family lost their protector and gradually fell into disfavor. Irate as he was, Hitler confided to several intimates that he respected Hess for his willingness to sacrifice himself on such a dangerous mission. On reflection he realized that his deputy had made the hazardous flight for him. Hitler did not believe that Hess was mad, only foolish not to have seen what a disastrous political mistake he was making. Albrecht Haushofer was arrested two days after Hess’s departure and taken to Adolf Hitler’s mountain residence, the Berghof, in Bavaria in southern Germany near the Austrian border. There he was questioned (though Hitler refused to see him) and wrote a self-serving account for the Führer entitled “English Connections and the Possibility of Using Them.” After eight weeks of detention, he was released. The Gestapo arrested and interrogated Hess’s entire staff and everyone associated with him—adjutants, orderlies, secretaries, chauffeurs, and his brother Alfred. The interrogators walked on eggshells, however, for if Hitler had in fact authorized the flight, the organization did not want to get involved; but if Hess acted alone he’d committed high treason. Albrecht Haushofer eventually concluded that Hitler must be killed. After the failed July 20, 1944 bomb plot he went into hiding, but was arrested at a farm in Bavaria in December and incarcerated in Berlin’s Moabit prison. He was executed by the SS as Communist troops entered the city in April 1945. Albrecht’s father Karl Haushofer was also imprisoned by the Gestapo for eight months, but released. Following the conquest of Germany he was interrogated by a Catholic priest attached to the Allied-Communist forces in order to determine whether he should stand trial at Nuremberg for war crimes. On the night of March 10–11, 1946, he and his wife committed suicide. Within two weeks of his arrival—and arrest—in Great Britain, Hess knew that his mission had failed. The remainder of his life was a long, strange saga worthy of an Orwellian order whose rulers are completely deranged. His ordeal—which you must study in order to comprehend—really cannot be described any other way. Hess was imprisoned in the Tower of London (the last prisoner to be held in the 900-year-old fortress), endlessly interrogated, confined in electronically bugged cells, injected with sodium pentothal (“truth serum”), tried as a “war criminal” before the kangaroo court at Nuremberg where he remained steadfastly loyal to Hitler and contemptuous of the proceedings, and imprisoned for decades at Spandau, situated in the British sector of Berlin deep inside Communist East Germany under barbarous conditions, where he finally died, ostensibly a suicide, at the age of 93 in 1987. To this day Britain has not released its files on Hess. The reason Hess may be thought of as part of the resistance, in addition to his close association with the treasonous Albrecht Haushofer, is that opposition to Hitler existed throughout the entire period of the Third Reich, was not exclusively Leftist, and included numerous people of the highest rank, especially in the Wehrmacht (armed forces) and Abwehr (military intelligence). Even war hero General Erwin Rommel was a member. It also explains, in part, why elites from the beginning have had such a bizarre, irrational fixation with Hess the symbol. Two weeks after Hess’s death, Spandau was leveled to the ground to prevent it from becoming a shrine. For 20 years following the release of Albert Speer and Baldur von Schirach in 1966, Hess had been the huge fortress’s sole occupant. To ensure its complete erasure, all materials from the demolished prison were ground to powder and dumped in the North Sea or buried at the nearby Royal Air Force base in Spandau borough. The site itself was transformed into a parking facility and shopping center. In 2011, Rudolf Hess’s remains were secretly exhumed at night from the family burial plot in the Bavarian town of Wunsiedel in southern Germany. The decayed body was cremated and scattered at sea in a secret operation. According to the Daily Mail  (UK), “Holocaust survivors [Jews] welcomed the move. ‘There is now one less place of evil in the world,’” said New York City’s Elan Steinberg. The family gravestone with the epitaph “Ich hab’s gewagt” (“I have dared”) was destroyed.